There’s a new app in town for kitesurfing fanatics. We all know that once people get hooked on a new sport, they go a little bit nuts over it. Well, now you have the chance to share your passion with like-minded people. Not only do you get to surf the best waves, you get to make new friends while doing it! The app is the brainchild of Lukas Reusch and Max Fischer, both epic kitesurfers. One of the features of the app that they are most proud of, is the live spot communication. Want to find other people that also enjoy your favorite kitesurfing spots? Simply search for a spot, mark it as your favorite, and voila, you become part of the community. You can also subscribe to notifications about your favorite spots for up to date information. If you can’t find the spot you love, you can add it to the map to introduce it to other kitesurfers from around the world. Add a few tips or images about the place or share an on-the-fly spot report. Sure, you can check a weather app for the daily forecast. Or maybe you are lucky and there’s a webcam set up at your favorite kitesurfing spot. But the best way to get the most reliable information about the weather, surfing conditions, and state of the waves – is from someone kitesurfing at your spot. 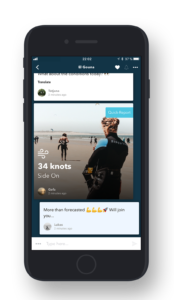 The Kitecloud app is all about building a supportive community for kitesurfers. By sharing information with fellow kitesurfers, everybody’s experience of the sport is enhanced. An on-the-fly spot report will offer you live-time information about the weather conditions, wind intensity, and wave quality. It will also provide you with an indication of how many people are currently kitesurfing at a specific spot. You can also add your own picture or video. Once you really get into kitesurfing, you are bound to start dreaming about traveling to awesome spots around the world. And you will most definitely need awesome people from all over the globe to tell you where you should and shouldn’t kitesurf. While travelling you don’t want to waste your time (or money) on the wrong places. With the Kitecloud app you can instantly find the best kitesurfing spots all around the world. 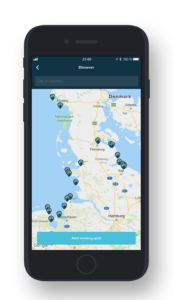 Use the spot-map, type in the city or village you will be visiting, and the nearest kitesurfing spots will pop up. Once you’ve added it to your favorite spots, you can start chatting to people that have kitesurfed at the specific spot. Remember to activate the notifications so you can constantly stay in the loop. And you can use the app in a language you are comfortable with. The language options include English, German, Spanish, French and Russian. Nobody likes missing out on a good kitesurfing session. FOMO is real! With the Kitecloud app you never have to worry about that again. And you can feel like a real VIP as part of a worldwide social network specifically for kitesurfers! 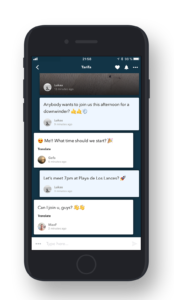 Not only can you get live updates of your favorite kitesurfing spots around the world, you can share your experiences with other kitesurfers. Plus, you can plan sessions with potential new friends in a foreign country, create car pools for kitesurfing trips. And you can find out who feels like grabbing a beer after the session. It’s a great way to immerse yourself in a country you are travelling to; ask a local to give you some tips on activities, the kite-spot options in the area, or kite-schools. So, what are you waiting for? Join the coolest community ever! Download the app now on Google Play storeand the iTunes store.